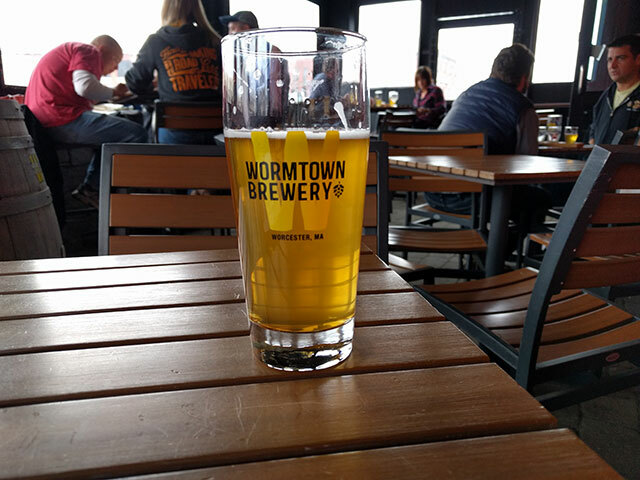 If you are cruising through the Wu and got nothing going on, you could do worse that stopping by Wormtown Brewery on Shrewsbury Street. While the taproom itself is decent, the enclosed patio is where it's at. In Worcester on Shrewsbury Street. What a great place in the city to be located. Being located right of 290 makes the Wormtown Brewery an easy place to visit. Plenty of parking, conveniently located downtown, near a ton of restaurants, I mean, why wait 2 hours in line at Treehouse when you could have beer immediately before grabbing some croquetas at nearby Bocado!? 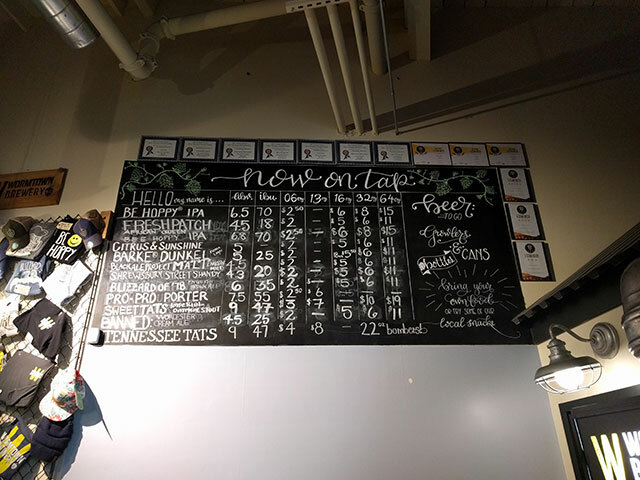 If you are starting a brewery tour of Worcester from the Wormtown Brewery, you could head north to the Greater Good, or, southwest toward Flying Dreams and the 3cross Coop. Wormtown started in an ice cream stand in 2010. A couple of people had a dream and saw it through to reality. They started winning medals at beer festivals and refining their “3 decker attitude”. Eventually, they graduated to the larger Shrewsbury Street location. Area restaurants like the Horseshoe Pub in Hudson (near Medusa Brewing and Ground Effect) and Prezo’s in Milford (near Craft Roots Brewing) helped secure their future by serving their beer on-site. FREE tours on the weekend: Saturday & Sunday at 12:30pm, 1:30pm & 2:30pm. 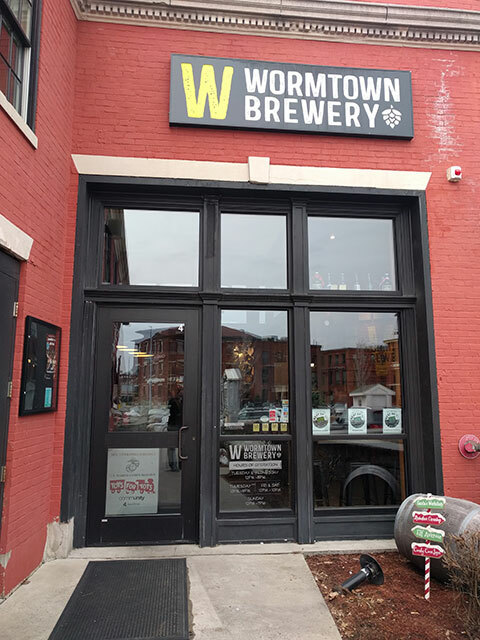 Is the Wormtown Brewery kid friendly? Maybe? Doubt it. I’m not really sure. Without food, it seems like a 21+ establishment. Which craft beer to choose? What types of beer does brew? All types: wheat beers, pumpkin ales, IPAs, stouts, porters, etc. Yes to growler fills. And, yes to flights, if my notes serve me correctly. It was a brewery tour day, so the details became as hazy as a juicy NEIPA. It’s much more of a brewery than a brewpub with a mug club. Plenty of merch. All the usual: hats, shirts, etc. Is this where I sign up for the tour? Pretzels. Otherwise, bring your own food in. I noticed people brought pizza, chips ‘n salsa, and other snacky snacks. In fact, people I saw from the Greater Good had traveled there as well. 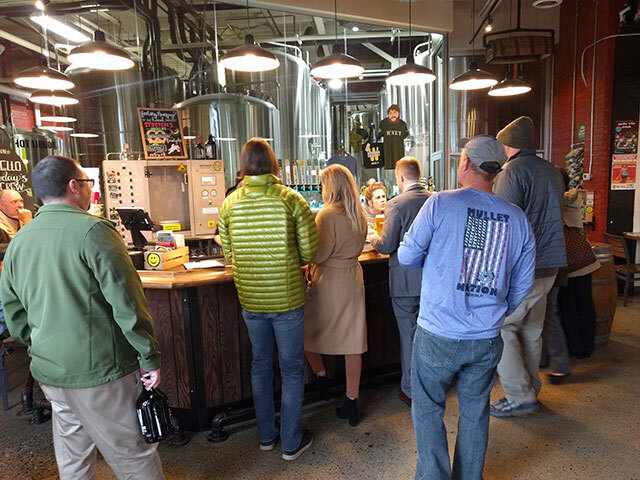 Brewery hopping is a (new) national pastime. To be perfectly honest, maybe they have more to offer than pretzels. I just usally stop looking for anything else when I pretzels are offered. I don’t think so. Unless you count horn honks on Shrewsbury Street. Can I buy their beers in stores? Yes. Load up on all of the Be Hoppy you want to drink. The outdoor enclosed patio is/was the main attraction. Fun yellow chairs. Space heaters for the enclosed space. It opens up in better weather, so half the year, considering it’s the northeast. If I had to pick one brewery within Worcester city limits to visit, it would be the Greater Good Imperial Brewing Company. Better beer, food, atmosphere, etc. That’s not to say that Wormtown is bad, far from it. Just not the coolest kid on the Worcester brewing block.